How to print all the Mondays in given month and year in Java? 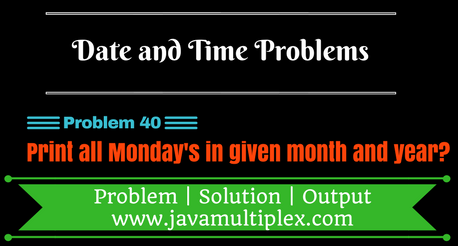 Home Date Interview Questions Difficult Date Questions How to print all the Mondays in given month and year in Java? Write a program in Java that prints all the Mondays in given month and year. For example in Jan2017 there are 5 Mondays and dates are 02/01/2017, 09/01/2017, 16/01/2017, 23/01/2017, 30/01/2017. If you have read our previous date and time problems then believe me this problem would be piece of cake for you. With the help of Calendar class constants MONTH, YEAR, DAY_OF_MONTH and DAY_OF_WEEK we can easily solve this problem. Find number of days in given month. Set given month and year in Calendar. Iterate the loop from 1 to number of days ( Step 1 ) times. Set the day of month as current index in Calendar. Check the day, if it is Monday print it else go to Step 3. How to find number of days in given month? How to check whether given year is leap year or not? How to get all the information about given date? * @problem Print all mondays of given month and year? // Adding given month and year in Calendar. * then increase the counter and print date. // Adding day of month in Calendar. 1) How to print all the Sundays in given month and year? 2) How to print all the Tuesdays in given month and year? 3) How to print all the Wednesdays in given month and year? 4) How to print all the Thursdays in given month and year? 5) How to print all the Fridays in given month and year? 6) How to print all the Saturdays in given month and year? Tags : Date and Time Problems, DateFormat, SimpleDateFormat, String, Calendar, if else statement, switch statement, List, ArrayList, Leap Year.